Google I/O was heavy on Android in nearly every way. Android L was announced as a developer preview, Android Wear is for sale now with two nice looking smartwatches with a third on the way. Android TV will pick-up where Chromecast left off and now Google is in the car. Android Auto made its way into the spotlight and like Android Wear, the user experience relies on the Google Now card notifications allowing for input responses using the car’s own controls or by voice command. Through the Open Automotive Alliance, dozens of vehicle manufacturers, from Alfa Romeo to Volvo, are on board to begin offering vehicles with Android Auto as part of the mix. Google had Android Auto on display in a number of vehicles at the developer conference, a small Chevy, a sleek Audi S3, a Ford, and a Honda Civic sedan as well, effectively encompassing the breadth of support Google has behind the initiative. 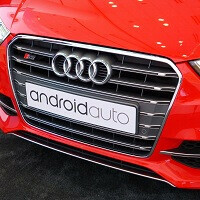 We got to enjoy our demonstration in the bright red Audi and see the functionality of the Android Auto in action. One interesting factor about Android Auto is that it does not try to be all things to all systems in a vehicle. It does not attempt to take over the heating and air conditioning or other functions. Rather, it consolidates data from your phone and presents what is relevant in a manner that is hopefully less distracting than holding a phone in the hand while still allowing the user to communicate. Android Auto connects via Bluetooth with an Android phone. The rest as you can see from the demonstration below, is fairly simple. The Google Now UI ensures that not too much information is flooding the screen to distract the driver. It is a nice execution. All told, this looks like a competent and competitive response to Apple’s CarPlay, and judging by the participation in the Open Automotive Alliance, it looks like the advantage goes to Google. Looks like I'll have to jockey into position for a new Ford next year, instead of a used older model like I was originally planning on. Or maybe I'm just dreaming again. I don't see ford on the list Sniggly heck I don't even see Toyota on their, guess I'll wait till my 05' Toyota is dead and buy a Honda. They said in this article that Ford had a vehicle demo at the show, and previously Ford was mentioned as a partner. The panels in the cars get old fast. I would prefer to have a "drive mode" on my 8 inch tablet and a holder instead of this. i got the new audi a3, so how soon can i do this? just open the bluetooth and connect? What if we use a nexus as the head unit ? Ford is a possible future partner. Their looking at the Apple version for now but its possible they could eventually offer both. Im not a Ford person but thought I would add that. Today, Most of digital devices are based on Android. Many Leading Automaker companies also use Android device in the car. New Upcoming Top Luxury Cars are completely controlled to smartphone. I doubt most luxury cars are completely controlled by smartphone. There is a lot of security surrounding services to the end user that are taken VERY seriously. Chevy has a few models where you can use your smartphone to access locks, ignition, etc. But with some cars going to 'drive by wire' meaning that even the braking, steering and fuel (think gas pedal) systems are completely electrical this poses a huge risk if someone was to break into the cars internal network of computers and begin messing around. I doubt we will ever really see where smartphones control cars. It will be a one-off such as with say batman who controls the batmobile with his smartphone. There are just too many risks associated with giving the the ability to so much, not to the end user but because of the potential for someone to misuse the technology to either cause harm on purpose or accident.